TRICK OR TREAT! Early voting ends this Friday, October 31st. Click here for the early voting locations in your county and here for Mignon’s early voting primer. Tuesday, November 4th, is Election Day. If you are an Election Day voter, you can find your Election Day polling location here. GO VOTE! This week, The Daily Show with Jon Stewart, shoots in Austin at the ZACH Theatre. The Austin episodes have been dubbed “Democalypse 2014: South by South Mess.” Guests include: Ebola, guns, food trailers, BBQ-master Aaron Franklin, Senator Wendy Davis, Congressman Joaquin Castro, and the band Spoon. Phil Collins returned to the Alamo to deliver his private collection of Texas artifacts. Items like Davy Crockett’s leather pouch and gun, Jim Bowie’s famous knife, and letters from William B. Travis were transported in crates to the Alamo Executive Offices located in the Gallagher House in San Antonio. This weekend people from all over the world will flock to Austin for F1 weekend. In addition to F1 races, the Circuit of the Americas track has hosted 200+ events this past year. Races, the ESPN X Games, and multiple concerts at the Austin360 Amphitheater, have created a combined impact of $897 million on Austin’s economy. Since the track’s opening nearly three years ago, its estimated impact on the city’s economy is $2.8 billion. The Texas State Cemetery is just blocks away from the Capitol on the east side of I-35. 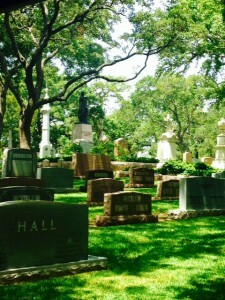 The cemetery was established in 1851, with the death and burial of General Edward Burleson, who served with Sam Houston in the Battle of San Jacinto. 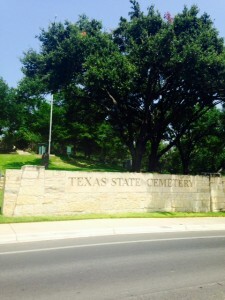 Stephen F. Austin, Governor John Connally, Governor Ann Richards, Lieutenant Governor Bob Bullock, Congresswoman Barbara Jordan, and author James Michener are just a few of the other “Honored Texans” that have found a final resting place at the State Cemetery. The grounds of the cemetery are open 8am-5pm daily and guided tours may be booked through the Texas State Cemetery office. Get in the spirit of Halloween and stop by for a visit.